Written on January 6, 2006 by Rylan & Kaitlyn. I just heard the news. I am going to Disneyland! My mom and dad are so excited about taking me on my first real trip. They are looking forward to being in a car with me for 5 hours. Maybe I will be nice and not cry the whole way there. I guess my crying could keep my daddy from falling asleep at the wheel though so well see. I look forward to seeing Mickey. I have been looking at him in my car for a month now and I cant wait until I can see him in person. My mommy and daddy are going to take a bazillion pictures of me and my Disney friends. Its going to be so fun that I may just sleep right through it all. 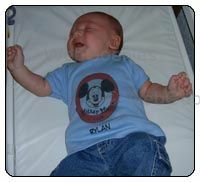 Mommy made me my own Mickey Club t shirt for me to wear at the park. I wonder if my friend Mickey will notice and give me a big hug because of it. That would be great! I bet my dad will post some Disney pictures when we return, or maybe from the hotel room I think he said. Look forward to these pictures as they should be nice with daddy's new camera. To wrap things up for the week, Dad figured out a way to scare me but I don't mind, In fact I seem to like it. He will look at me then wham, he blows on my face. It makes me jump and then makes mommy and daddy laugh. I then smile which makes them laugh and smile even more. Its fun to have us all smiling at the same time. Silly mom & dad making you jump. You should find out something funny to make them jump, like a tickle spot.